I am pleased to contribute to this book from my friend, colleague, and mentor Erik Dalton. My chapter on Myofascial Meridians outlines several metaphors helpful to a holistic approach to structural and movement therapies, and then describes one map of larger functioning continuities within the musculoskeletal system. These continuities, termed myofascial meridians, wind longitudinally through the myofascial tissues around the bones and joints. These ideas are unfolded in detail in the book Anatomy Trains (Elsevier, 2001, 2009), and at www.AnatomyTrains.com Anatomy Trains provides a traceable basis for effective treatment at some distance from the site of dysfunction or pain. This new view of structural patterning has far-reaching implications for treatment strategies, especially for longstanding postural imbalances, unsound body usage, and sequelae from injury or insult. The very structure of our language, and its cause-and-effect epistemology, requires that we understand any system by dividing it into its constituent parts, in order to define the contribution of each identifiable bit to the whole. A tree has roots, trunk, branches, and leaves, each with an essential function. The leaves have stomata, mesophyll, and veins. The veins have xylem and phloem bundled in a sheath. And so on down the line of smaller and smaller building blocks: cells, macromolecules, atoms, and quantum forces. This analytical process is fundamental to our Western comprehension of the world. But this way of thinking presents one significant danger when we apply it to living systems such as trees and ourselves: The tree did not glue a root system to a trunk and bolt on branches with leaves wired to them – it sprang from a single seed and is forever a co-evolving unitary set of system interactions from root to leaf. In reality, the parts are never separated, but always codependent. Humans are not assembled out of parts like a car or a computer. “Body as machine” is a useful metaphor, but like any poetic trope, it does not tell the whole story. In our modern perception of human movement anatomy, however, we are in danger of making this metaphor into the be all and end all. In reality, our bodies are conceived as a whole, and our bodies grow, live, and die as a whole – but the mind is a knife. Central to this new Anatomy Trains map (Fig. 6) is the functional unity of the connective tissue system. 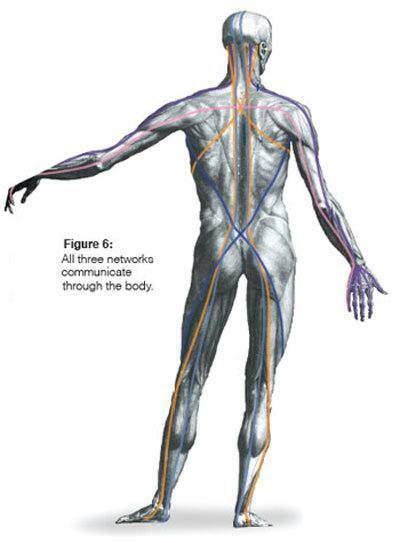 There are exactly three networks within the body that, magically extracted intact, would show us the shape of the whole body, inside and out: the vascular system, the neural net, and the extracellular fibrous web created by the connective tissue cells. Large communities of cells need vast infrastructure to survive in crowded conditions, especially resting on land, surrounded by air, and with pressing needs to maintain their biochemistry. It is an astounding feat of engineering we take for granted every day: A community of 70 trillion diverse, humming, and semi-autonomous cells, each built for undersea living, organizes itself to get up and walk around. Thomas Myers studied with Drs Ida Rolf, Moshe Feldenkrais, and Buckminster Fuller. He has also benefitted from studying movement meditation, biomechanics, and the martial arts. Myers is the author of Anatomy Trains (Elsevier 2001, 2009, 2013) and multiple supporting videos, as well as 100 articles on anatomy and soft tissue manipulation and the social scourge of somatic alienation that replaces kinesthetic intelligence. In practice for nearly 40 years in a variety of clinical and cultural settings, Tom is a member of the International Association of Structural Integrators and a certified Touch-in-Parenting instructor, with a strong interest in perinatal issues. Myers lives with his partner Quan on the coast of Maine, where he directs online and in-person professional certification and continuing education courses for manual therapists and movement educators around the world. For more information on Thomas Myers visit his website.